After eight years hiatus, it appears as if Satoshi Nakamoto is back activating his P2P Foundation account. By befriending one Wagner Tamanaha and commenting “Nour” the crypto space was quick to react with some skeptical saying his account might have been hacked. Now, whether Satoshi is back or not, it all depends on whether he shall make a comeback on his BitcoinTalk account giving insight on the way forward especially on contentious issues surrounding scalability. And in the midst of all this, it will be exciting how Craig Wright respond to the “awaken” Satoshi. While this is exciting, regulators across the globe are working overtime to bring law and order in the space. Days after passing a new Financial Bill, law makers in Estonia did amend the Anti Money Laundering and Terrorist Financing Prevention Act to include crypto clauses and sync with the EU’s Fourth Money Laundering Prevention Directive. By doing so, the Estonian Financial Supervision Authority (FI) believes they shall clamp down and prevent undesirable elements from laundering or financing terrorist activities through crypto platforms. Meanwhile, the SEC boss Jay Clayton—though issuing disclaimer clarifying that his comments are his—said in a recent discussion that Bitcoin is a utility since no group has control of it. He further went on and said that while the technology is new, crypto assets and platforms should comply with time-tested rules set by the commission. "An asset like Bitcoin, where decentralized […] it is designed as to be a payment system replacement for sovereign currencies. We have determined that it does not have the attributes of a security." After week ending Nov 25, we expected Bitcoin prices to capitulate but it didn’t. BTC/USD is down 0.5 percent in the last week but pretty stable in the last day. However, this doesn’t mean bulls are in control despite the high trade volumes supporting prices above $3,700. In fact, from candlestick arrangement, BTC/USD could sink below $3,000 confirming week ending Nov 25 losses. 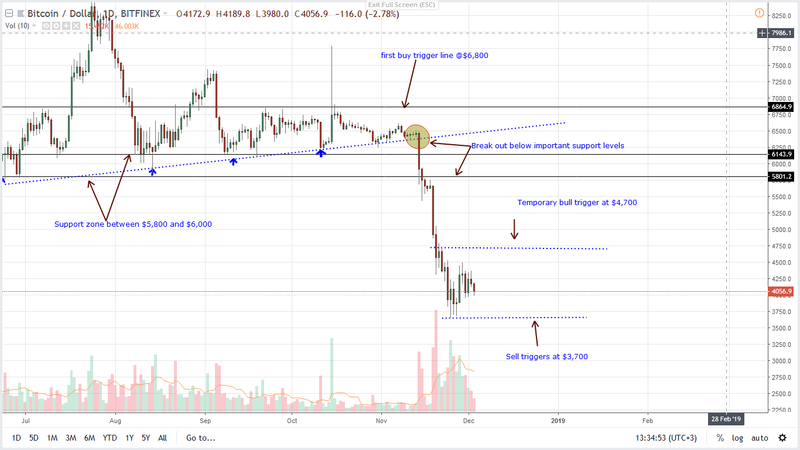 It has been a steep fall for Bitcoin and after clearing the $5,800 main support line thanks to Nov 14 uncertainty ahead of BCH hard fork and hash war, BTC is yet to recover. From the chart, the fall has been almost perpendicular. Therefore, before we fade this bear trend there must be strong gains above our minor resistance line at $4,700. Thing is BTC/USD might be bearish but is finding strong support between $3,700 and $4,000 and better still oscillating in a $1,000 range between $3,700—or Nov 2018 lows and $4,700—the upper limit of this consolidation. Now, within this accumulation, Nov 25—82k versus 47k average and Nov 28—68k versus 65k average are bull bars of our concern. Notice that we might end up with a three-bar bullish reversal pattern if buyers build enough momentum, racing above $4,700 triggering buys in the process. And from an effort versus result point of view this could print out now that price action is still confined within Nov 28 high lows—a bull bar with above average volumes. After Nov 14-15 declines, BTC/USD did break below the 11-month support zone in a bear break out pattern. This meltdown is clear in higher time frame especially the weekly chart where the close below the wedge did trigger the next wave of bears leading to a whole bear bar printing below $5,800. Now, despite this $1,000 consolidation, bears are in control and for bulls to be in charge then we must see gains above $4,700. Technically, bears are in charge and before we recommend bulls, we must see confirmation of Nov 25 and 28 high volume bull bars and completion of the three-bar bull reversal pattern—the Morning Star pattern as prices close above $4,7000 triggering bulls aiming at $5,500 and $6,000. If not and there are drops below $3,700 or Nov 25 lows, then we might see further declines towards $3,000 or lower. All Charts Courtesy of Trading View. This is not Investment Advice. Do your Own Research. I don’t have to be friends with any company or any miner. All I need to do is build, and people will use it. As long as you build something useful, you are judged by what you build, instead of who you know.